Life-size little zombie girl standing prop that holds a doll in her posable arms. Awesome rotting flesh detail on face. Metal rods keep this zombie standing firmly atop the base. Heads, hands, and feet are plastic. Measures 48'' tall. Nice prop. Very easy to put together even though it doesn't come with instructions. The only issue is a chunk of her hair isn't glued on and is falling off. 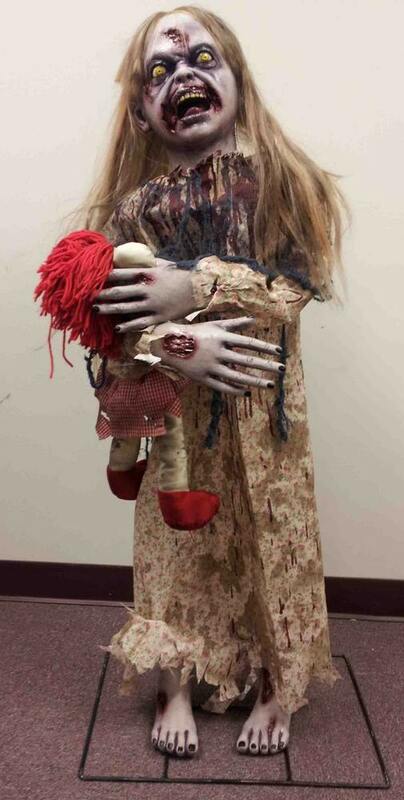 This is an awesome prop, she is a life size little girl,and is very scary. The only issue In had with her is that she didn't come with instructions. Awesome prop! I will be putting this beside the Moldy Mommy prop in the rocking chair. Should make for an awesome display and scare! I was a little concerned about the size of her hands from the promo pic, however they were no where near as large as pictured. Everything about this prop is awesome.